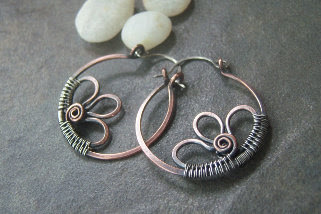 Rustic Daisy Hoop Earrings Tutorial, presented by Julie from JewlieBeads, yet another fantastic hoop earrings design Julie had finalized. If you want to have a piece of this from Julie, you could drop her a message in Etsy at JewlieBeads's Etsy store, she will then consult you with it's price. As usual, our guest artists offer their tutorial on our wire jewelry tutorial instant download site with 20% discount (T&C applied), we hope to offer you an opportunity to buy more with less, so do grab the chance soon.